The cornerstone of any movie collection is the work of a few filmmakers whose shots, cuts, plots, and styles are imitated forever after. They are the masters. They hold the keys to the language of cinema, and knowing them, recognizing their reverberations everywhere, is half the fun of the movies. A previous post, Then, Voyager, provides a quick synopsis of the first years of the Criterion Collection and its nascent days as a true pioneer of the home video revolution and market. The Criterion Collection 1996 Comprehensive Catalog provides a beautiful snapshot of that golden age of the laser disc special edition. Twelve years ago, we set out to collect only the best films from every genre, period, and country, and to publish them all under a banner that announced they had met the essential criterion. 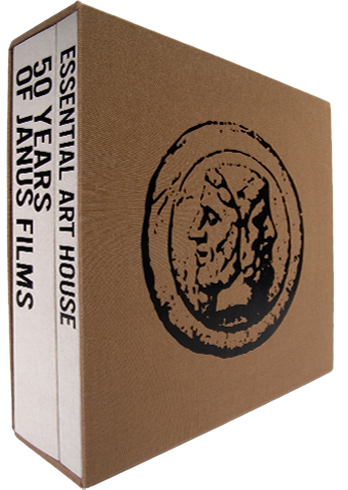 The Criterion Collection is known not only for what we publish, but how we publish, with releases that offer the highest technical quality and many award-winning, laserdisc-original supplements. Popular favorites, lost treasures, and landmark films from around the world, this is the closest thing that we know to a perfect shelf of movies. The laser disc had less than two years to live at Criterion when this catalog was published. Never have I seen the company wax so proudly about itself in print before or after this. Perhaps this tone comes from an impending awareness that the end of an era was near, and that the upcoming DVD era was far from certain to provide the same level of acceptance for this niche player in the industry. If so, they had little of which to be concerned. In the beginning, directors chose to work with Criterion because we were the only label committed to showing movies as they were meant to be seen, letterboxed with new digital transfers made from the best available elements. Before long we began recording audio commentaries by directors, restoring director’s cuts, collecting deleted scenes, gag reels, shooting scripts, early shorts, storyboards. To date, […] 35 filmmakers have made our Director Approved library the most significant archive of contemporary filmmaking available to the home viewer. Gordon Reynolds designed the catalog. He was prolific designer for CC in the early days and seems to have had a strong hand in the look and feel of their early aesthetic. This catalog was a nice representation of Janus at their 40th anniversary. They certainly outdid themselves when the 50th came along. Many of the employees listed on page 2 seem to have gone their own way over the years, but the biggies are certainly still there and represented. Of the 35 auteurs in the Director Approved series at that time, a full 10 have never made it back into the collection in the modern era. The Voyager Laserdiscs that are listed are a fascinating list of special interest titles, some of which would make it to the 5-inch era as true Criterion titles.